TL;DR: Go to the bulleted list below. I am aware of the nonidealities of these components, so extreme precision is not a important role here, since I don't intend to replace my good ol' bench supply. I will wire a digital voltmeter/ammeter to the output for calibration. About the resistors R3 and R6, is it correct to pull up a MOSFET gate for such operations? Should I pull it down instead? Or remove the resistors? I am concerned about LM324 output sink/source capabilities with those resistors. Also, in my output circuit, should I add other components to improve safety and stability? And last but not least: is it safe to charge a li-ion battery with this circuit? (Considering a 2200mAh battery, with 4.2V max voltage) If not, how could I improve this circuit to achieve this? Any help/advice will be very apprecieated! R3 and R6 have no effect, except maybe during startup. I would make R6 a pulldown to help start the output at 0V. As drawn, the current control is probably unstable because it has gain but no compensation. Add a resistor (10k?) between the shunt and the inverting input, and a small capacitor (100p?) between the output and inverting input of U1B. This slows down the current control by making fast changes to its output appear immediately at its inverting output and will prevent it from oscillating. Also, the output resistance will be 1 ohm, because the voltage control doesn't consider R4. Overall I don't think this is a good setup. 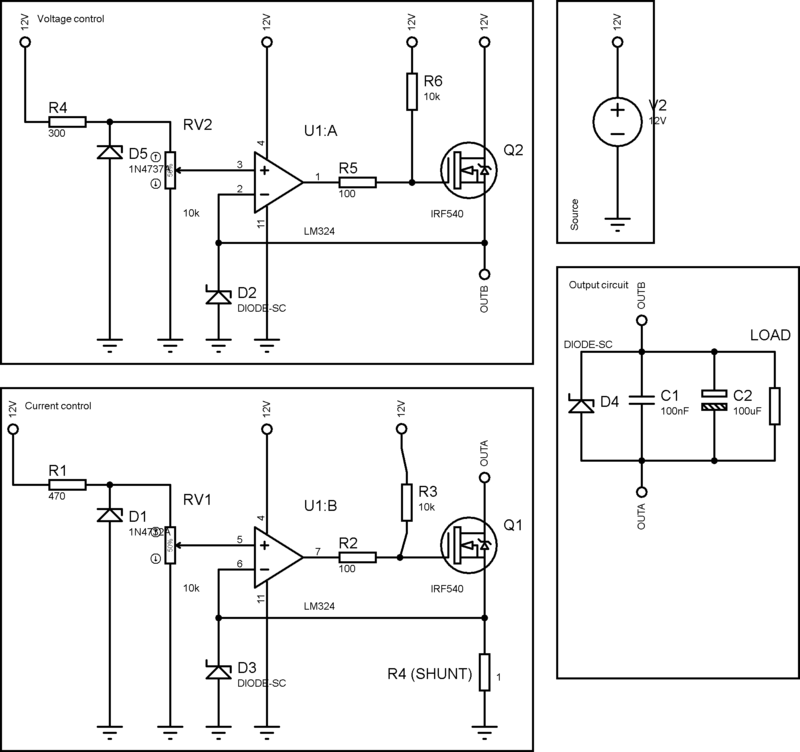 You should look at some other bench power supply schematics and see what they do. Not the answer you're looking for? Browse other questions tagged power-supply operational-amplifier mosfet circuit-design lithium or ask your own question. What happens when a power metal film resistor is exposed to higher power? Built a power supply but output isn't smooth enough? Why can't this LM324 op amp reproduce a signal above a certain frequency?